18 Aug How Much Does a Modular Home Cost? Building a modular home can be an intimidating idea if you’ve never done it before. At Next Modular, our goal is to make that process as simple and straightforward as possible when you build with us. Before breaking ground on your property, we make sure you know exactly what kind of home you’re getting, how it will be built, the modular home costs, and what general time frame to expect for the building process. We’ll do our best to find a home solution that fits with your ideal purchase price, and if you choose for us to be your general contractor for the site work (foundation, etc. ), we will work hard to get you the most value for your hard earned dollars. One of the most common questions we get here is “how much does all the other stuff like the foundation, well, septic, etc. cost?” In this post, we will give you some ballpark figures for what other modular home costs to expect. PLEASE NOTE: THE COST OF MODULAR HOMES VARIES CONSIDERABLY FROM REGION TO REGION. THE FIGURES IN THIS POST ARE BALLPARK NUMBERS BASED ON OUR LOCAL MARKET CONDITIONS AT THE CURRENT TIME (WINTER 2018). The price of the basic home structure depends on the modular home floor plan you select. You can see the base price of all our homes on the website, and this number includes sales tax, delivery to your location, setting and fastening to your foundation, up to $3,000 in crane fees, and the interior and exterior finish work after the home is set (basement steps or exterior porches/decks/steps not included). However, you also need to figure in for additional costs on top of the home price. Some of these additional costs are optional (like the garage) and others are not (water hookup). They also vary depending on whether or not you are building on developed or undeveloped land. Either way, we want you to know your options and have a general idea of the costs involved in building a custom modular home. Your modular home must be set on and anchored to a foundation. There are two basic types to choose from, a basement or a crawlspace (a slab foundation is not an option for a modular home). Both have their pros and cons and which one you choose depends solely on preference. A basic poured basement with 8-foot walls, an egress window, insulation on the exterior to meet code, and a set of stairs will cost between $23,000 to $29,000 for a 1,600 SF ranch home. A basement gives you additional storage or living space, but it also costs much more than a simple crawlspace. Your foundation cost will, of course, vary with the size of the home footprint. Even with the additional cost, if you consider all the extra living space and storage you receive, a basement can be a good investment. 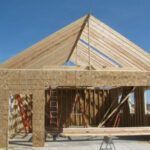 A block crawlspace that is around 4’ deep, including an access panel and foam board insulation to meet code will typically add to your modular home cost from $8,000 to $10,000 for a 1,600 SF ranch home. Crawlspaces can serve as a storm shelter in an emergency, and sometimes people will use them for minor storage (although they’re not easy to walk around in!). Your ductwork and utility lines will also be in the crawlspace. Once again, the cost will vary with the size. A full HVAC system install, including the furnace, AC, air ducts and gas lines to the furnace will generally cost between $8,000 and $11,000 for a 1,600 SF ranch home. All homes need heat and air-conditioning. Your HVAC system includes not only the main unit but also the air ducts and gas lines that run beneath your home. Due to the large variation in options for furnace and air conditioner brands, we price the HVAC system separate from the home itself. 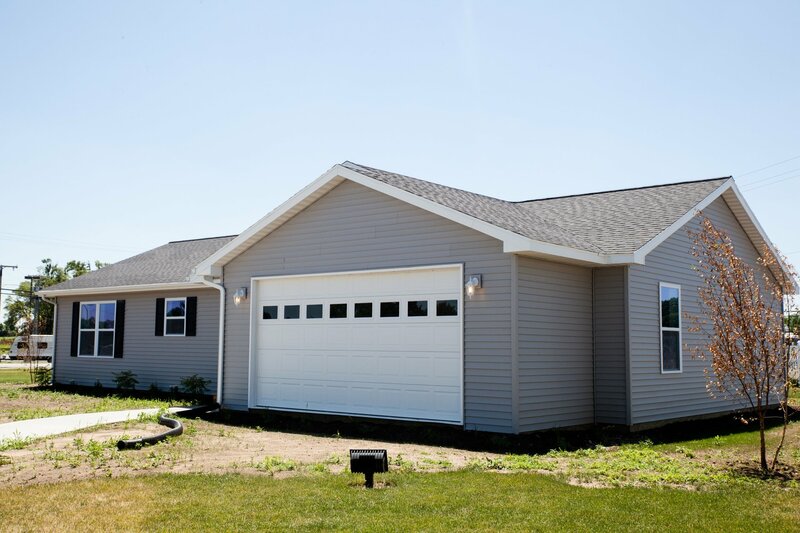 A simple 22X22 attached garage, including the garage door and opener, siding/roofing, and concrete work will add to your modular home cost between $17,000 and $20,000. A garage is optional, but not only does it add to the value of your home, but it also protects cars and increases storage. A garage is basically made up of two components, the poured concrete floor, and the walls/roof, but if you want to customize a garage to suit your individual needs, we are happy to do so. 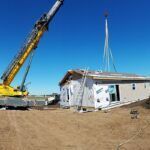 A drilled well that is 60 feet deep, including the bladder tank and water line hookups to the home will add to your modular home cost between $4,000 and $5,000. City Water costs vary considerably. The decision between doing a private well or city hookup is based on where your home will be located. If you are within city limits, there will be tap-in fees for both the water and sewer that must be paid to the local authorities. Every city’s fees are different, so we suggest you call the local water company and ask them about their hookup charges. A standard “in-ground” septic system with a single tank and leach field in good soil will typically add to your modular home cost between $5,000 and $8,000. City Sewer connection costs vary considerably. Like your water connections, your sewer system will depend on the location of your home. If you are within city limits, you will need to pay the connection fees to hook up to the city’s sewers. These costs can be determined by calling the city building department and asking about Sewer Tap Fees. If you are located outside the city’s service area, then you will need to install a private septic system. If you are outside of city limits, and a standard leach field system will not work, you will have to do a mound septic system. The determining factor is the type of soil at your location. “Bad” soil will require a mound system. The average cost for a mound system will depend on soil conditions, the size of the mound, tanks and lift pumps necessary, and regional availability of the special type of sand needed for the mound. As a result, it is difficult to give average prices for a mound system. Installing an electric “meter base” on the home and running the line from the outside meter base into your home’s electric panel will add to your modular home cost between $2,000 and $3,000. This would also include miscellaneous electrical work needed per code requirements (a light in the crawlspace, for instance). You need a meter base for the local electric company to hook into with their service line and to install the electric meter on. Normally, the utility company will run lines to your home for free, unless it is far off the beaten path. Once those lines are run, additional wires must connect the meter base to the breaker box inside. There may be other electric lines to run, depending on whether you have a garage or not, and on the local codes governing light/circuit needs in the basement or crawlspace. If your home uses natural gas, then just like with electrical, you will need a gas meter and gas lines run under the home. Hookup to the local gas service may require a deposit or fee depending on the company, but the gas utility company will usually run the lines to your home and install a gas meter for free, depending on how far they have to run the lines. If you need a propane tank, the propane provider will typically charge you a set fee to set the tank, run the line to your home, install the pressure reducing valves, and also charge to fill the tank with propane. It is best to call a local provider for a quote. But remember, when you hire us as your General Contractor we will handle all this for you! During our years of building and installing modular homes, we have seen total permit costs fluctuate from a low of $500 to as high as $4000. Average permit costs are difficult to determine. Just like stick-built homes, modular homes require a building permit. Local ordinances dictate how much a permit might cost (and it varies quite a bit). Usually, the permit costs are determined by the size of the home, and there may be permits necessary for the driveway as well. You can call your local building department and ask what the fees are for your area. A good ballpark for concrete work is $4 to $6 per square foot for a 4” thick drive. A good ballpark for a 10’ wide gravel drive is $5 to $7 per running foot of drive (for a longer drive). Like the garage, a driveway is technically an optional feature. However, except in rare circumstances, most homeowners are going to want some sort of driveway. At Next Modular, we can put in a driveway made of gravel, concrete or asphalt. Of the three, gravel is the least expensive initially but requires yearly maintenance. Asphalt presents a nice, finished look and costs less than concrete but also requires periodic maintenance. Concrete driveways are the most common because they last and they meet most city and homeowner’s association requirements. If you live in the city, you will probably be required to go with a concrete drive, and the cost will depend on the size. A gravel driveway is a good choice for a home out in the country where driveways can be longer and more costly if they are done with asphalt or concrete. We covered some of the common items that affect the cost of your custom modular home building project. There are other things to consider as well, which we’ll detail for you in your personal home estimate. Generally, these other charges include items such as General Contractor fees, gutters, lawn grading, etc. To make it easier to understand, we have put together a Sample Bid for a 1,680 SF home, based off of our Cedar Ranch Home (home price accurate as of November 2017). Includes: Base price, standard finishes, home delivery and setting, crane fees, and complete interior/exterior finish. See our FAQ section on the home page for more info. Includes 8’ poured basement walls, poured floor, exterior wall foam board insulation and a set of straight run basement stairs. Includes furnace, air conditioning, forced air and return lines, and gas lines. Includes drilling, bladder tank, and hook up to the home. Includes 1,000 gallon tank, leach field. Includes running PVC drains under home and out to septic tank, hooking to well bladder tank. Includes items such as gutters, permits, sidewalks, and our 13% General Contractor fee. We detail out all the potential modular home cost for building and installing your modular home before you begin. While some of the costs are dependent on your building site, the majority are predetermined and relatively easy to figure. According to HomeAdvisor.com, the average price for a stick-built home is $150/sq ft. Based on this figure, the total cost for this same home built by traditional means would be $252,000. That’s a big difference! Purchasing a modular home means you can afford more house for less money. However, you won’t sacrifice any of the quality or flexibility of a stick-built home. We want you to feel comfortable with the process, so we spell out all the costs before you purchase. Call us and let us put together an estimate for your next home.